Dr. Shere was raised in Houston, Texas attending school all the way up until dental school. After graduating from Klein High School, Dr. Shere went to the University of Houston. Dr. Shere went to Baylor College of Dentistry, one of the premier institutions in the country and graduated in 2008. Patients can visit dr. Shere for dental exams, Fillings, X-rays, Extractions, Prophylaxis, Crowns, Fluoride Treatment, Bridges, Sealants, Root canals and many other treatments. Building a foundation of trust by treating our patients as special individuals is vital to our success. We understand how uneasy some patients may feel about their dental visits and how we can make a difference in providing a relaxing and positive experience. Our entire team is dedicated to providing you with excellent, personalized care and service to make your visit as comfortable and pleasant as possible and we offer easy financing so you can have affordable payments without delaying your treatment. We thank you for allowing us to take care of your dental needs and look forward to serving you. I will nerve be back. The staff was great, friendly, and pleasent. They gave me options that worked with me. Awesome Dr. It had been a long time since I had been to the dentist and I was super nervous to go. The process was easy and fast and the staff was amazing! I don't know what I was so nervous about!! Everyone from the moment you walk in are so personable and professional. I was very nervous about going to the dentist and I left very comfortable. They work with you financially and their prices are acceptable. They are straight to the work and truly care about your well being. I did wait about 30 minutes, but I don't mind since I was able to get an appointment on Saturday. Dr. Shere was super nice. There was no upselling or anything like that, they were very professional and straightforward. I waited an hour to be seen. But overall he's s great dentisr. I self paid and they work with you. PVery nice staff. The staff was very nice, the financial counselor is awesome. She understands and she will work with you. I went in for the very first time today and would have left with every problem fixed with my mouth if I didnot have to leave to have other business. However, do not expect to get seen tight away on a Saturday, thus is their busiest day, and the reason I had to wait 2 hours before being seen. Other than the long Saturday wait, everything else was great. I rescheduled for my work to be done the following week thus time on a weekday. I highly recommend Dr.Shere''s office. I really dislike the dentist but my visit here was great! I have fond my new dentist and have recommended him to co-workers.. He is awesome!!! He is very friendly and does a very good job, very flexible with his clients! I hate going to the dentist but Dr Shere was wonderful . He helped me stay calm and my teeth look amazing. I highly recommend him. It was great dental experience! I actually felt at ease! I loved it. I have had horrible experiences in the past that have kept me from going to a dentist for many years. Everyone that I met greeted me with a smile. The whole team made me feel at ease anddidn't make me feel bad for not having seen a dentist in so long. I would definitely recommend him to anyone looking for a dentist. A Team of professionals. I was received quickly and they explain every steps and answered my questions. 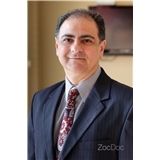 Dr. Syed Saif Shere, DDS has no appointments on Zocdoc right now.